Linking to Another Article in the New Blogger. ~ The Blog Doctor. You are here: Home > Post Editor > Linking to Another Article in the New Blogger. This is because in Classic Blogger each post does not reside on its own page/URL by default. Adding the "Related Link" to my blog works, but the post title still points to the 'related article' as well. Is there a way to use the Link field with the "Related Article" code, and have the post-title revert back to its permalink? 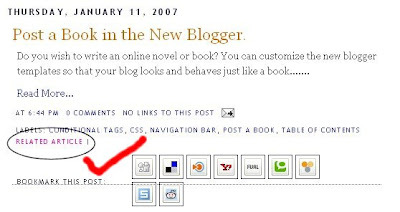 The post title links to the permalink by default in the original blogger layouts. If you can email the template to me I will look at the code and inform you about any modifications. The address is in the middle column. hi! im having a hard time looking for a blog help about adding a "related links" to my post... then i was able to find your post on the HELP page, but when i tried to copy the code, it didnt show up on my blog. Did you put a check in the Expand widgets template box on Template---->Edit Html tab? Click my email address in middle column for detailed help. I was wondering: You know how you put this after the labels? on "line 2"? I see that line 3 is sort of dead but sitting there in the template. I tried to use that to put the RELATED ARTICLE code segment in line 3 but ended up with a mess. Both your examples use the classic template. What is the blog url where you are having difficulties? What is the exact link code you are pasting in the link field? If your template does not use widgets it is a classic template. The code in the post above is for layouts only. Bless you. I gave up a trial blog back in October because Beta wasn't supporting the links field. Now I will have to give it new life. I've made the titles of the articles into links on this blog. Now I just have to figure out what I want to do with it. hi i'm having the same problem as Tim - my titles are a permanent permalink - what html xml tag do i need to find to stop this happening default in the template? Delete above code. Save Template. Clear Cache and View Blog. I pasted the code as per your instructions.. I edited a post, put link fields in it and published it. I could not find the Related Articles in it. I checked the template. Expanded the widget template. I could not see the code that I had pasted there. I then downloaded the template and when I edited it.. I could see the pasted code there! Can you tell me whats going on? Why the extended template does not show the pasted code whereas one can see it after downloading. I find here what I searched for both in Google Help Center and Google Help Group! (Actually I got your page through Google Help Group only!). Thanks! 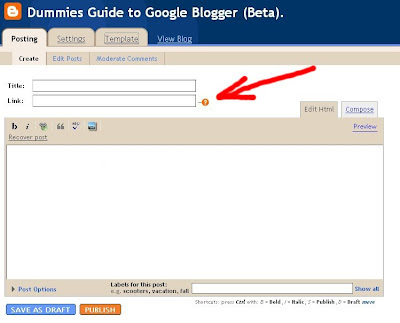 Vin, if blogger already has permalinks ot your blog title, why would you add permalink in your template? A permalink is a link of a post in your blog. This post is about linking to another article or page on the Internet. If you use the link field your post title gets linked to that page. Above I have given method by which you can link to another page and your post title will link to itself. Me again with the question about backlinks...I have enabled the linkfield and I do see the link field appears under the title. But I don't see the orange question mark. Because I use magazine templates, so I don't want to "Related Links" appears at the home page (it doesn't fit). Now the problem is I want to add more than just 2 backlinks, but I can't.